I have been performing as full time juggler and magician since graduating from Glasgow School of Art in 2000. One of the characters that I have been developing is the Jester, Angus Mc Laugh. I have attempted to make Angus as authentic as possible. He is now at a stage were he passes muster with Historic Scotland. What do I do? I can perform walk a bout, they do sometimes turn into little shows as in the photo. The photo was taken at Linlithgow palace in 2012. Or I can perform stage/street shows or offer circus skills workshops. I use a combination of juggling, magic and humour to add merriment to the event. I can do a show for up to 1 hour. I juggle knives, axe and ye olde baseball bat, while balancing on a roller bowler - and of course I also juggle good old fire. But don't worry, I'm fully insured through Equity and I can provide risk assessments for each activity. How do you you know I'm any good? I keep getting repeat bookings, last year for example I worked at Traquair House for the third year in a row, The Bruce Festival in 2012-14, with Historic Scotland I performed at the re-opening of the palace within Stirling Castle and have since then returned to Stirling Castle several times, I have also performed at Fort George, and repeatedly at Linlithgow Palace and Edinburgh Castle. In case one jester is not enough then you can also book Britta who has the additional advantage of being able to speak German, French, Spanish, Italian and a wee bit of the Gaelic. If you would like more information or to book me please call or email for more information. 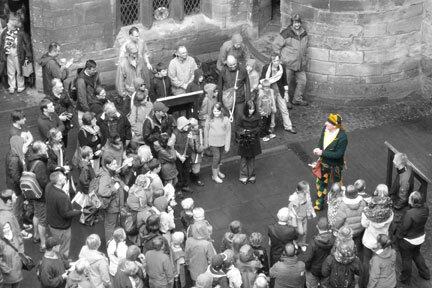 Introduced at Linlithgow Palace then improved at the Bruce festival Hobby Horse jousting. It went down well with kids of all ages. As you can see on the photo page the tent and flags making up the list will add a lot of colour to your event. For next season we will also have dragons and unicorns. The jousting is normally run by Lady Britta Mc Laugh.